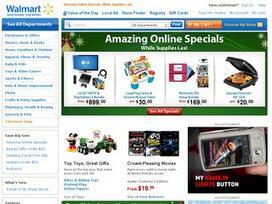 Walmart.com was established in 2000 as an extension of its Arkansas-based parent company, Wal-Mart Stores, Inc. The goal of Walmart.com is to offer Internet shoppers the same kind of high-quality merchandise at affordable prices advertised by its parent. Online shoppers can expect to find rollbacks and clearance items, just as they would expect to find in stores. Walmart.com makes a point of highlighting seasonal offerings, so online shoppers can navigate the site more easily at different times of the year. From holiday decorations for inside or outside the house, to board games, outdoor games, barbecue grills and outdoor furniture for summer gatherings in the backyard, visitors to the site will find the latest merchandise for every holiday, sporting event or special occasion. Bargain hunters will always find irresistible deals in the clearance section. The website also has plenty of clothing to satisfy the tastes of all members of the family. Expect to find a range of baby clothing for every age and every season, popular brands for young girls and boys, all of the newest styles for juniors, swimsuits, workout clothes, and clothing for sports fans, regardless of the team they support. People browsing Walmart.com will discover that it is an outstanding place to go to find necessities for a new baby, whether it be a crib, a stroller or a car seat. The online site has an extensive selection of furniture, including reasonably priced kitchen and dining room table sets. Walmart.com is an ideal place for college students to look for small, portable furniture for a dorm room or tiny off-campus apartment. The huge selection of every type of household appliance makes this site an excellent place to shop for a vacuum cleaner, carpet shampooer, or coffee maker. All sorts of other home furnishings are available, too. Walmart.com boasts a broad selection of bedding, from regular sheet sets to fancier hotel-quality sheet sets, comforters and blankets. Even the top-of-the-line linens are priced reasonably enough that budget-conscious consumers won't feel as though they're being pinched. Anyone who is pricing electronic equipment should look at what is available at Walmart.com. There are often deals that can't be found in stores. Flat-screen televisions are easily affordable, and shoppers can choose from budget brands to the best-known name brands without having to break the bank on purchases. Digital cameras are another find on the Walmart.com site, because the prices are so competitive. Other finds in the electronics department include computers (especially laptops), printers, MP3 players, DVD players, and Blu-ray players at rock-bottom prices, and, of course, a huge selection of movies and CDs. The huge selection of affordable merchandise makes Walmart.com a popular destination for holiday shopping, regardless of the time of day. Online shoppers will find that they can get, at the same affordable prices, many of the same things they'd expect to find in stores, without the need to brave crowds in the store or parking lot. An added bonus is the convenient shipping options. Share what you think about Walmart, and your favorite ways to save there! I literally shop here for everything! lowest prices on electronics by far and tons of coupons. Love Walmart. Great savings, wish it was easier to find free shipping coupons for online purchases.